Summary of today’s show: It’s a feast of topics today. Scot Landry and Fr. Matt Williams continue the discussion of the proposed pastoral plan for the Archdiocese of Boston presented to priests on Monday, by listening to a talk given by Fr. Jack Ahern on lessons learned pastoring three parishes. Then Scot welcomes Dr. Ray Guarendi, host of his own show on WQOM and one of the presenters at this Saturday’s WQOM conference in Lowell. Finally, Scot talks with Chris Harding and Carol Pirillo of the Cards Behind Bars ministry, which provides Christmas cards to prisoners to send to their families. 1st segment: Scot said to Fr. Matt that not only is it the beginning of Advent with the new Roman Missal translation, the God of This City tour last week, a Priests’ Convocation on Monday, a Sister Olga’s new religious community on Friday, and the WQOM conference on Saturday. Fr. Matt recapped the God of This City tour which had over 2,000 people take part over four nights. Friday evening was the culminating event at the Cathedral. They had five priests for confession and all night long the line was over 20 to 30 people deep. Some priests heard confessions for over 4 hours. It shows the need for more priests, but it also shows how the tour brings people to a deeper relationship with the Lord. Scot will begin today with a continuation of the conversation about this past Monday’s priest convocation. Among the speakers on Monday was Fr. Jack Ahern, about what it is like to be the first pastor in the Archdiocese to serve three parishes at once as pastor. His reflections moved the priests who were present. Fr. Jack Ahern: On his first day in Dorchester, following Mass, the lector asked to speak to him. He asked Fr. Jack why the cardinal would send a liberal elite to their parish. He said he must be liberal elite because he’s from Brookline and the Boston Globe likes him. It went down from there. There were painful decisions related to hiring and firing staff, adjusting the schedules and programs for each of the three parishes. Most people recognized the need for change, but the vocal minority made life difficult sometimes. One woman had Bishop Hennessey on speed-dial and called him at least once per week. Scot said when a pastor takes on three parishes you meet it with everything you have and most people embrace the priest and the change necessary. Fr. Matt said in a new assignment you expect to be welcomed with open arms. He suspects it was complicated by the changes that had already occurred in Dorchester. He said it’s difficult for the priest too because you want to shepherd these people and to experience this right at the beginning puts you on your heels. You can lose perspective in that the vocal minority can monopolize your attention. Scot said Fr. Jack was speaking to the concerns of the priests in the room who had not pastored more than one parish at a time. Fr. Jack delineated the challenges they would face. Fr. Jack: It hasn’t been easy, but it’s true for all the priests. For himself and his vicars, they have sometimes shown up at the right time but the wrong church for Mass. The schedules don’t always allow them to be together as one in all activities. It’s an adjustment for the parishioners who do not understand why you cannot be present. Combining programs and celebrations is a slow process. The most difficult adjustment for the priests is that the parishioners are used to seeing their priests each and every week. They would sometimes not see one of the priests for one or two weeks. At times he feels like an absentee father. He misses the intimacies involved in being pastor of one parish. Scot said a key point was the challenge for priests who miss seeing the same people every day or every week when they serve multiple communities. Fr. Matt said what father isn’t present for his family? It’s ingrained in us from a natural level. Fr. Matt said it beckons us to consider Jesus as an itinerant preacher, who never stayed in one place for very long. It’s a greater sacrifice of self for the priest. Scot reiterated that the future pastoral plan is a proposal right now in which all will be asked to give their feedback before Cardinal Seán makes a final decision. The current proposal is for a Pastoral Service Team of one pastor and one or more parochial vicars and assistants to serve two or three parishes. Fr. Jack: Unable to be present with one parish week in and week out, without the intimacy for the parish priest, it’s not easy to move into. The one consolation that has come his way is that he’s been graced with a deeper intimacy with Jesus. Scot said Fr. Jack has relied more on Jesus to balance the demands of three parishes which has given him great joy and peace. Fr. Matt said that God can never be outdone in generosity. Scot said Cardinal Seán and the commission recognize that its better for priests to live in community. Fr. Jack: Regarding living with priests, Fr. Doc Conway who works with Fr. Jack has come to recognize the joy of living with other priests, having served his last few assignments alone. Fr. Jack said he’s having the time of his life and the other two priests who live with him are too, which makes an incredible difference for the parishes and their own lives as well. Fr. Matt said there is a rich sharing between three men of such different ages and backgrounds. Fr. Doc is older, Fr. Jack is in about his mid-50s, and Fr. Huy is newly ordained. He said there’s so much a young priest can learn from older priests when they live with them. Scot said when he encounters Fr. Jack, who not only serves in a community that has gone through rough times, but serves three parishes, he is struck by how joy-filled he is. Fr. Jack: As of today, there are 26 situations where priests and pastoral staffs are responsible for multiple parishes and more with multiple worship sites. This proposal recognizes that reality and calls us to get ahead of the curve in such a way that together with him we can bring more energy and life to our parishes, provide a greater sense of stability to the people, and do the work of Christ with the people in new creative and life-giving ways. The future is unknown, but as we move forward in the power of the Holy Spirit we do so with great confidence that great things will happen. Scot said that was the conclusion of Fr. Jack’s address. Fr. Matt said we have to shift from maintenance to mission. Cardinal Sean is moving us to intentionally live mission and be about the work of evangelization. The new structure will allow priests to be shepherds of the community. Scot encouraged everyone to go to Planning2012.org and read the documents and watch the videos and then give feedback when it’s requested. 2nd segment: It’s time to announce this week’s winner of the WQOM Benefactor Raffle. Our prizes this week are Let Us Adore Him by the Dady Brothers , A CD of Christmas music; a $15 Mystic Monk Coffee gift card; a box of Chocolate Butter Nut Much, made by the Nuns of Mount Saint Mary Abbey, whose candy is available from TrappistineCandy.com. This week’s benefactor card raffle winner is Gerard Hubbard from Braintree, MA. Congratulation, Gerard! 3rd segment: Scot welcomed Dr. Ray Guarendi to the show. He will be a speaker at the WQOM conference on Saturday. Scot asked him last time he was in Boston. Dr. Ray used to be a regular guest on a morning TV show on Channel 7. 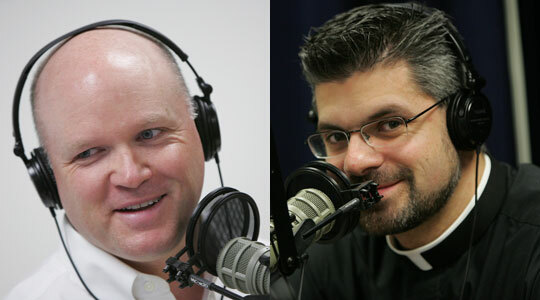 Scot asked him why Catholic radio is such a wonderful tool of evangelization. Dr. Ray said it’s because it works and works for so little money. Radio is everywhere and you can listen to it whatever you’re doing. It’s very inexpensive compared to TV. You can acquire new listeners just by scraping them up as they run up and down the dial. Dr. Ray’s show is heard throughout the US and even people around the world will send him emails, having listened to his show via the computer. He’s also on SiriusXM satellite radio’s channel 130, the Catholic Channel. Dr. Ray’s talk on Saturday will be called, “Laughter: The Sanity of the Family.” Dr. Ray promised attendees will laugh and will leave standing stronger in their faith. They will feel more confident in their authority and less nervous as parents. Scot said Dr. Ray has spoken in about 2,000 venues. Why is it important for people to come and hear the presentations versus just listening on the radio. Dr. Ray said people tell him he’s very different in person than on the radio. On the air he’s limited by the topics and callers. when first asked to do Catholic radio, he said No because he was so busy with his live speaking. What happened was he tried it on a trial basis and was so moved by the power of radio to bring people back to the faith and change lives, that he said he couldn’t refuse. He will be bringing his books and tapes to sell. He notes that in most conferences people wait to hear him before buying his materials. But at Catholic conferences people will buy his books and tapes first. 4th segment: Scot welcomed Chris Harding and Carol Pirillo from the Cards Behind Bars ministry. Scot said Carol has been involved in the ministry since 1978 and Chris has been involved for the past four years. Chris said prisoners are so disempowered, especially around Christmas, and parents couldn’t make cards for children or friends. They have been working chaplains to make available excess cards from donations to prisoners. Chris said we have to remember Christ’s words that we are to visit the imprisoned as a period of trial and regeneration. It’s incumbent upon everyone to put Christ back in Christmas to make these cards available and make them feel again like citizens and good parents. Scot asked what standards they have for the Christmas cards? Chris said they encourage people to, in their parishes, to get donations of Christmas cards. A large majority are unused cards sent by religious orders soliciting donations. But what they really look for are people to shop after Christmas, especially Spanish language cards, for cards that will be heavily discounted. Chris suggested people call him at 617-282-3521 or via the link at the top of this page. Carol said she’s collected more than 8,000 cards over the years. They give each man 10 cards. Most of them men have no access to cards and they couldn’t afford to buy them even if they were available. In the past, the prisoners have swapped contraband in order to get their access to cards. Chris said it makes prisoners feel like valuable citizens and part of the greater Catholic community. Scot said it nurtures the relationships that can keep them out of prison when their time is up. Scot said most Catholic households receive a number of unsolicited cards at their home and buying discounted cards is a low-cost way to be thoughtful to those who have far less than we have. The Letter to the Hebrews tells us to be mindful of the imprisoned and be with them as if we were imprisoned with them. Scot reminded listeners that tomorrow is the Feast of the Immaculate Conception and a holy day of obligation. There will be Masses tonight, tomorrow morning and even tomorrow evening in most parishes. Fr. Matt said Friday is the deadline for anyone who wants to go on the youth and young adult pilgrimage to the March for Life. There are tracks for middle school, high school, and young adults. They will stay for varying lengths of time in DC. Register at www.one4boston.org. Last year more than 300 went and this year they’re anticipating more than 400 so they need to make plans for travel and accommodations.